We are a small group of first year undergraduates who volunteered to help archive the footage and audio files about the Kogi that Alan Ereira left to the university. He is a British historian, documentary filmmaker, author and Professor of Practice of University of Wales Trinity Saint David. None of the data has been seen by the world before and it is exciting to be part of a process that will bring new ethnographic information to the world. The Kogi are a very secretive and reclusive people. Hence every piece of information about them is invaluable to understanding their culture. 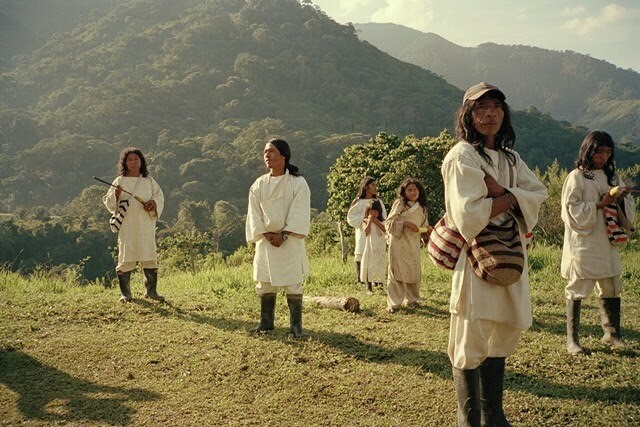 They live in the Sierra Nevada, an incredible mountain range in Colombia that they consider the heart of the world. We all first heard about the Kogi in our Anthropology module, ‘People’s Worlds’ with Luci Attala. She kindly gave us the opportunity to start this project. Our interest grew after watching Alan’s two films, Heart of the World and Aluna (2012). He made these two movies in collaboration with the Kogi who wanted to send a message to the world. They see us as the Younger Brother and after years of isolation they decided to get in touch with us because they believe we are hurting the world. The Mamas are the priests who communicate with Aluna, “the source of life and intelligence.” The word Mama means light in the Kogi language, the Mamas are thus the enlightened ones. They spend most of their time thinking. We all have our own opinion about the Kogi, their message, Alan’s movies and book. However we all agree that there is something special about these people. We were all touched in a way or another by what we got to know about them. We felt like it was a big privilege to be able to look at these footage, never seen by anyone before. Obviously the task happened to be a little bit more complicated than we had expected. After receiving the hard drive with the data, we soon discovered that the material was quite difficult to unravel. We were not able to open the audio files, and the video files were poorly optimized, the quality of the sound and the image made the archiving process difficult. So at first, we had to tackle all the technical problems. Now, we have managed to make the data more accessible by dividing it into rational segments. Our plan is to look at all of the footage, trying to classify and label the shorter segments. So far we have listened to interviews with Kogis and some Mamas trying to explain their understanding of the world and some of their practices. We are really looking forward meeting Alan Ereira and talk with him in person. He will be coming to Lampeter to take part in the Harmony and Activism Conference on March 14th 2018.